The 53rd anniversary of the 1959 10th March Tibetan National Uprising is being commemorated under the dark shadows of 25 Tibetans driven to self-immolation, out of which 19 have succumbed to their injuries and 8 others became victim of the indiscriminate police firings on peaceful Tibetan demonstrators in Tibet in the last one year alone. The whereabouts and well being of others are unknown. Many have been incarcerated and many other forced disappearance cases have been reported. Even as we meet here today, we can well imagine what might be going on inside Tibet now. In fact, since the 2008 nationwide demonstrations, the situation in Tibet has continued to be tense. Farmer’s non-cooperation in farming in 2009 and student’s protests against the imposition of Mandarin language in 2010 are among many other peaceful protests and demonstrations that continued to the present day. Monk Tapey was the first to resort to this action when he self immolated on 27th of February 2009. On behalf of all the Tibetans, the Tibetan Parliament in Exile pays homage to those who lost their lives and pray for their noble rebirth. To those who continue to suffer, we share your pain. Now we all have to put our efforts together to make sure that their sacrifices do not go in vain. Why do the peaceful Tibetans have to undergo so much pain? For the freedom to think, to express, to act and of choice, just as anyone in the free world enjoys. That is an individual’s birthright. Burning one’s body in full consciousness and with conviction involves thorough deliberation with the self, conviction and mental courage, especially when one is motivated by benefit for others through self-sacrifice. Under other circumstances, the tendency is normally to hurt the other. That is not the case in Tibet. Premier Wen Jiabao in his effort to hide the reality of the situation and to divert the attention of the Chinese and the international community has deplorably termed the self immolations in Tibet as an act of terrorism. We would not be surprised if they adopt this view into law tomorrow! Hundreds and thousands of protests take place in China, but when it comes to managing protest demonstrations, it is teargas on Chinese and bullets on Tibetans. Will there ever be a respite for the peaceful Tibetans, who just long for the return of His Holiness the Dalai Lama and freedom. How many more Tibetan lives have to be lost till an amicable solution is found or will the whole of Tibet fall victim to the ongoing cultural genocide? All human beings, irrespective of differences in gender, race, color, wealth and political ideology aspire for happiness. To freely practice and promote your language, religion, culture and way of life are fundamental to human happiness. Unfortunately, in the present day China, there are not enough sensible leaders who understand that one’s happiness lies in the happiness of others in this interdependent world. Turning a deaf ear and blind eye to the reality of the situation will have serious consequences. When a time comes regretting what could have been done, would be too late. Since time immemorial, Tibetans and the Chinese lived as any two good neighbors could be. Tibetans have neither harmed the Chinese people nor interest of China. We enjoyed relatively good spiritual relations with all the emperors of China- be it the Mongol Yuan, Chinese Ming or Manchu Ching dynasties. None of our neighboring countries have directly interfered in the administration of Tibet. Only when the wave of communism swept over Russia and China, Tibet too fell victim to Mao’s voracious expansionist appetite. Considering the reality of the situation in Tibet and what we are up against, His Holiness the Dalai Lama has taken a very pragmatic and mutually beneficial step by not seeking independence but meaningful autonomy for all the Tibetan areas – thereby, addressing the biggest concern of China – sovereignty. 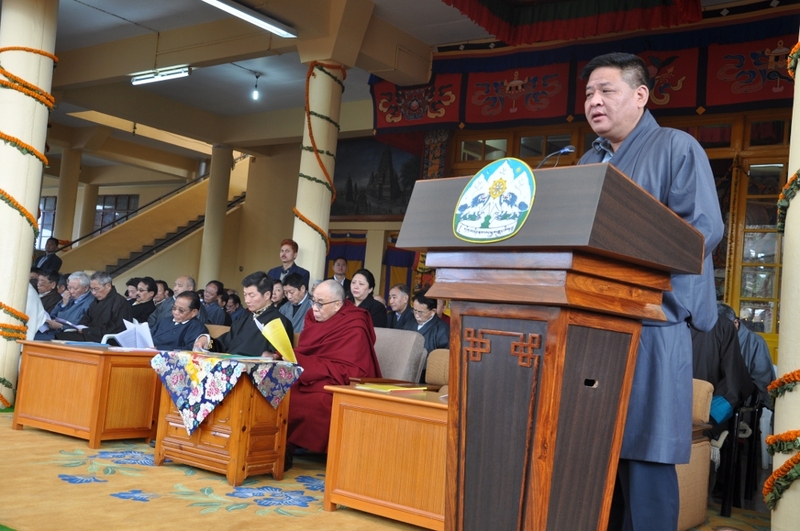 Post – devolution of His Holiness’ responsibilities, we remain committed to the Middle Way Approach through non-violence and a lasting negotiated settlement. Nine rounds of dialogue have not yielded any tangible results, mainly due to the intransigence of the Chinese leaders, who feel that if they manage to curb the activities of His Holiness the Dalai Lama and the Tibetans in exile through diplomatic and political coercions, the Tibetans inside could be muzzled to subservience. With no positive response from China, the dialogue remains disrupted, despite our all out effort with the written proposal which they asked for, and explanations to their mis-representations as per the provisions in the Constitution and the autonomy law enacted by the National People’s Congress. The essence of a law is not only in enacting it but in implementing it. To diffuse the urgency of the situation in Tibet and to seek a lasting solution to the issue of Tibet, in the interest of China and in the interest of the Tibetans, the Chinese leadership should immediately engage in serious negotiation with our leadership with the commitment and conviction to come to a mutually agreeable solution. We have no doubt that the resolution of the Tibet Issue in a just manner will have many positive effects on peace and stability of the whole geo-strategic region. In the ongoing NPC and CPPCC, Mr. Jia Qinglin, President of the NPCC made baseless allegations against His Holiness the Dalai lama for instigating unrest in Tibet that is laughable. The whole world knows what His Holiness stands for. The functioning of the Central Tibetan Administration is transparent and we have time and again offered our offices for scrutiny to the Chinese authorities. Meanwhile in Tibet, the policies and programs of the Chinese authorities have always been aimed at eradication of the Tibetan national identity. They have successfully done that with the Manchus, and it is happening right now in Inner Mongolia, Tibet and Uighur. Much of what Tibet was has been destroyed in the last more than 60 years. Through planned demographic aggression by way of infrastructure development, unscrupulous exploitation of natural resources and urbanization; cities and towns in Tibet have been taken over by the majority Chinese population. New migrant mining townships are sprouting all over. Tibetans are marginalized politically, economically and socially. It will not be long before Tibet towns become small pockets of Tibetan residents in a Chinese over-populated Tibet. A party ideologue and United Work Front’s Vice Minister, Zhu Weiqun’s recent posturing in a party journal on doing away with ethnic identities to promote nationalism sounds ominous – like fixing the last nail on the coffin. When your jobs are being snatched away by others, opportunities taken away, considered second-class citizens in your own land, how would one feel? Whereas Han Chinese receives preferential treatment for a posting in Tibet – better pay, natural promotions, free education and government jobs for children etc. These discriminatory measures are difficult for the Tibetans to digest. More than that, striking at the very heart and mind of the Tibetan people is the freedom to practice religion. Tibetans have been devout Buddhists, a belief embedded into its culture and way of life, acquired over more than 13 centuries. Due to which, Tibetans have lived in perfect harmony with nature and peaceful co-existence with our neighbours. The unique culture of the Tibetans rooted in Buddha’s teaching. Along with other religions, it has the potential for generating a more compassionate and a peaceful world. Even after more than 60 years the Chinese leaders have not learnt that the carrot and stick policy did not bring happiness for the Tibetan people. For 60 long years, the authorities tried to brainwash the Tibetans. Look at Tibet today. Tibetans in Tibet, particularly the younger generations, who have never seen His Holiness the Dalai Lama or those who were born after the Cultural Revolution are leading the movement inside Tibet. Look at the reality. Some estimate about 13 million believers in the Communist Party! It is time, the authorities grant religious freedom to all religious groups. Stop turning the study centers and places of worship into mere tourist attraction. How on earth will it help to create a harmonious society when Mao, Deng, Jiang and Hu’s pictures were displayed in the monasteries by force alongside statues of the Buddha when there is widespread unhappiness? How are you suppose to win over people’s mind and heart by turning the monasteries and nunneries into virtual military garrison or police posts, communist party offices? How would you feel, if your movements are restricted as well as monitored all the time, just as you are doing it to the monks and nuns? How would a believer feel, if the reincarnation of the high lamas have to be approved by an atheist government? Rubbing salt on the open wounds in the Tibetan hearts and minds will only breed more defiance. When there is no human dignity, there is nothing to lose. Forcing the Tibetan nomads into settled communities in or around existing townships not only had adverse impact on environmental stewardship but also on the way of life and future livelihood of the displaced Tibetans. Managing the watershed area of the some of major rivers of Asia that flows into 10 neighboring countries including China requires modern scientific research as well as indigenous wisdom acquired over centuries of having lived in the region. Instead of pushing away the Tibetan nomads, the government should make the local Tibetans, partners in regenerating programs. The authorities should not only review and stop the ongoing program but also provide full compensation and facilitate better livelihood for a smooth transition from the traditional way of life to a new way of life to the victims of the massive social engineering directed by the government. No one questions the growth of China as a global power economically and militarily. Now, it has to grow into a responsible, trusted and respected global leader. However, neither can trust be built without proper understanding and respect for each other nor by use of force and intimidation. Without trust, there cannot be harmony and stability. Respect has to be earned. Harmony within the nation cannot be achieved till people are given freedom and for instance, harmonious neighborhood cannot be maintained by claiming the whole of South China Sea. For a start, China could release all the political prisoners including Panchen Rinpoche to build trust. When we were younger, we were instilled the value of supporting the underdog, who is bullied. Today when China is bullying the Tibetans, Uighurs and their own people, the world community still courts the bully. We do off-course understand that there are many more urgent problems like Syria, Iran, North Korea and much larger economic, energy, security and environmental issues. Having said that, I wish to stress that the self immolations in Tibet in large numbers is not such a small issue. The powerful nations of the world were very much part of the Tibetan history when we lost our country. Now we feel it is time for the world leaders to reiterate more forcefully on the need to settle the Tibet issue through dialogue. Since we are not asking for separation, that does not go against your One China policy and it addresses the main concern of China – it’s sovereignty. Our struggle will continue. The UN should not be a pawn in the hands of the veto wielding few. We need all your support now! Though we have to find a solution by talking with China, the catalyst to make it happen sooner is in your hands, before it is too late. Let our people also share the freedom that the free world enjoys. As the World Bank said, China has reached a turning point. Just as it recommended, it is time for sweeping political and economic changes. Otherwise, today’s economic boon could turn into China’s bane tomorrow. China ending up social and political chaos will have serious consequences on the world. It is time to change now! I am sure better sense will prevail over the Chinese leadership. We also hope that at this moment of China’s turning point, the genuine and legitimate aspirations of the Tibetan people will also be addressed. The Tibetan Parliament in Exile take this opportunity to thank the government and people for their unwavering support and the International Community who took the side of truth, non-violence, justice, freedom and human dignity. To conclude, I again wish to express our gratitude to His Holiness the Dalai Lama for his guidance and leadership; pray for the reunion of all the Tibetans in Tibet and for the long life of His Holiness the Dalai Lama.